When? 21 February 2019, 9:00 a.m. The Research Training Group SocialCars funded by the German Research Foundation (DFG) and the DAAD Graduate School Scholarship Programme (GSSP) jointly award two full scholarships for doctoral studies in the fields of Autonomous Driving, V2X Communication, Vehicle Routing and Platooning, Microscopic Traffic Modelling, Geoinformatics and Human Factors Psychology. We are pleased to welcome Hekmat Dabbas as doctoral candidate to the team of SocialCars! From September 27 to September 28, 2018 the fifth retreat of SocialCars took place at the "Benediktinerkloster Huysburg". On August 15th the annual Public Authority Relay Marathon took place in Braunschweig. In total 110 relays started this year. At the end of the day our SocialCars-Team took the 60th place with a time of 03:31:53 hours. Congratualtion! Hao Cheng received the best paper award of the AGILE conference - the most prestiguous GIS conference in Europe. 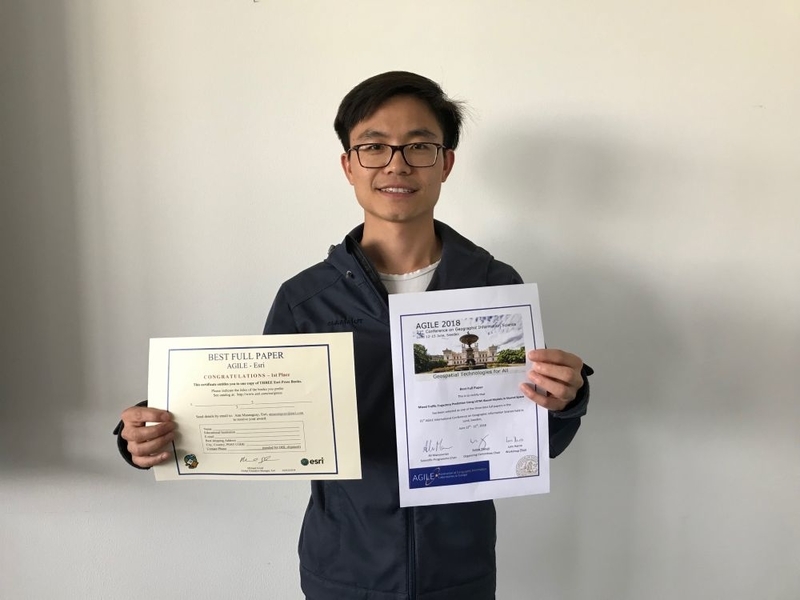 Hao Chen received the best paper award of the AGILE conference for his paper: H. Cheng and M. Sester (2018): Mixed traffic trajectory prediction using LSTM–based models in shared space, 21st AGILE Conference on Geographic Information Science, 2018; Lund; Sweden, Volume part F3, 2018, Pages 309-32. When? 18th June 2018, 10:00 a.m. The Research Training Group SocialCars funded by the German Research Foundation (DFG) is seeking for a Doctoral Researcher (salary scale E13 TV L) specializing in sustainable cooperative traffic management for urban environments. Deutsche Forschungsgemeinschaft (DFG) bewilligt zweite Förderperiode des Graduiertenkollegs „SocialCars – Kooperatives, (de)zentrales Verkehrsmanagement". Weltweit leben immer mehr Menschen in von Dichte geprägten städtischen Räumen. Gleichzeitig wachsen die Ansprüche an die Qualität des urbanen Lebensraums. In diesem Spannungsfeld erforscht das Graduiertenkolleg SocialCars neue Methoden und Anwendungen des kooperativen Verkehrsmanagements: Ein Steuerung des Verkehrs, bei der gesellschaftliche und individuelle Interessen gleichberechtigt berücksichtigt werden. So können neue Strategien für eine ökologisch verträgliche, sozial ausgewogene und effiziente Mobilität im urbanen Raum entstehen. In der zweiten Förderperiode von SocialCars werden dabei auch die Anforderungen automatisierter (Misch-)Verkehre und neuer Mobilitätsdienste in das dynamische Verkehrsmanagement einbezogen. Für lokale und stadtweite Regelungs- und Koordinationsstrategien ergeben sich dadurch ganz neue Herausforderungen aber auch die Chance, dass automatisierte Fahrzeuge den verträglichen, sicheren und effizienten gesamtstädtischer Verkehr wirkungsvoll unterstützen. Die DFG hat am 4. Mai 2018 die weitere Förderung des Graduiertenkollegs „SocialCars“ beschlossen. Nach der erfolgreichen ersten Förderperiode wird das Graduiertenkolleg für weitere viereinhalb Jahre (2018 – 2023) mit einem Fördervolumen von ca. 4,6 Millionen Euro unterstützt. In dem interdisziplinären Graduiertenkolleg forschen sechs Wissenschaftlerinnen und Wissenschaftler der Technischen Universität Braunschweig, der Technische Universität Clausthal und der Leibniz Universität Hannover gemeinsam am Verkehr der Zukunft. Der gemeinsame Arbeitsplatz der zwölf durch die DFG geförderten Doktorandinnen und Doktoranden befindet sich am Niedersächsischen Forschungszentrum Fahrzeugtechnik (NFF). When? 27th April 2018, 2 p.m. When? 13th April 2018, 4:30 p.m.
What? "Service Network Design of Bike Sharing Systems with Resource-Management Consideration"
When? 15th January 2018, 10 a.m. When? 12th January 2018, 11:30 a.m.
What? "Design of an adaptive Congestion Control Protocol for reliable Vehicle Safety Communication"
When? 20th December 2017, 4 p.m. When? 30th November 2017, 5 p.m.
As in recent years, PhD students of the Research Training Group participate in the NFF PhD Day. Further information on the programme and the awarding can be found here. Join Prof. Stephan Winter of the University of Melbourne for a presentation on “Smart Move - A conceptual view on the behaviour of driverless vehicles” and a following discussion. The lecture takes place on Monday, 18th September 2017 at 3:00 pm at room MZ 2 der Leibniz Universität Hannover (Appelstr. 9a 30167 Hannover). Stephan Winter is Professor and Discipline Leader, Geomatics, at the Department of Infrastructure Engineering, The University of Melbourne. He is a recognized researcher in spatial information science, specializing in human spatial cognition and interaction, and intelligent mobility / transport. He coordinates the smart city agenda of the Melbourne School of Engineering. In our research we look at the behaviour of driverless vehicles from multiple perspectives: interaction (e.g., with pedestrians intending to cross the road), coordination (e.g., strategies of platoon formation), and demand-responsive transportation (e.g., next-gen smart mobility). I'll give an overview of the ongoing work in our group. During an interview with the Braunschweiger Zeitung, the new chief executive of the Automotive Research Centre Niedersachsen (NFF) Thomas Vietor emphasizes on cooperations between different disciplines within a university to meet future challenges in mobility. He sets as a good example regarding such a beneficial cooperation the Research Training Group Social Cars. The whole interview can be found here (only available in German). 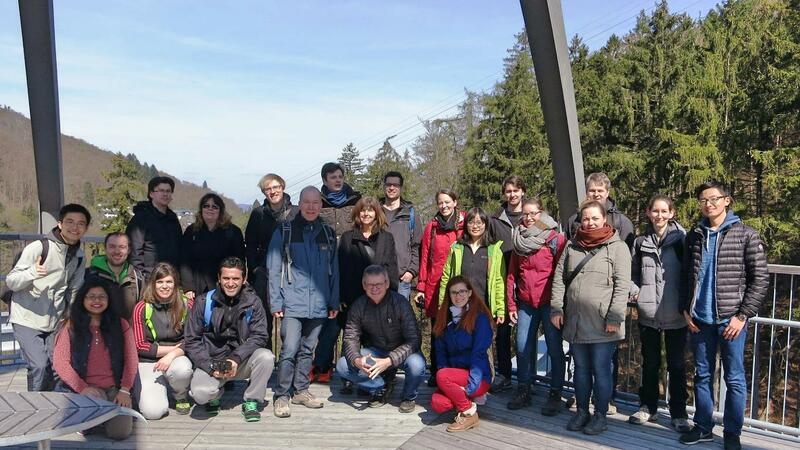 The new doctoral candidates were welcomed and the first generation of candidates was seen off at a hike in the Harz. Join Prof. Martin Baumann from Department of Human Factors of the University Ulm for a presentation on "Kooperative Fahrer-Fahrzeug-Interaktion – Herausforderungen und aktuelle Befunde" and a following discussion. The lecture takes place on Thursday, 16th March 2017 at 4:00 pm in Volkswagen 2 (NFF reserach building). Der technologische Fortschritt der letzten Jahrzehnte führt zur Entwicklung von Fahrer-Fahrzeug-Systemen, in denen das Fahrzeug zunehmend als eigenständiger Agent auftritt. Während derartige Systeme enormes Potential bieten, um den Fahrer in Bezug auf Sicherheit, Effizienz und Komfort zu unterstützen, ist dieses Potenzial nur dann vollständig zu auszuschöpfen, wenn die Fahrzeugautomation als unterstützender und kooperativer Partner des menschlichen Fahrers agiert. Wesentliche Voraussetzungen dafür sind die Schaffung eines geteilten Situationsverständnisses zwischen Fahrer und Automation, wechselseitige Vorhersehbarkeit, eine flexibel lenkbare Automation und angemessenes Vertrauen. In diesem Vortrag werden einige Ergebnisse zu unterschiedlichen Aspekten der Gestaltung einer kooperativen Fahrer-Fahrzeug-Interaktion berichtet. The Research Training Group SocialCars funded by the German Research Foundation (DFG) is seeking for a Doctoral Researcher (salary scale E13 TV L) specializing in Cooperative Driving Maneuvers. At the Research Training Group SocialCars jointly hosted at Technischen Universität Braunschweig, Technischen Universität Clausthal and Leibniz Universität Hannover are 12 Doctoral Researcher (Ph.D.) positions available. You'll find further information here. Join Prof. Barrett Thomas from Department of Management Sciences at the Tippie College of Business of the University of Iowa in Iowa City, Iowa for a presentation on „Optimizing for Costs and Emissions in Vehicle Routing in Urban Areas“ and a following discussion. The lecture takes place on Thursday, November 17, 2016 at 4 p.m. in Volkswagen 1 (NFF research building). The minimization of emissions has become an important topic in vehicle routing research. Still, minimizing costs remains one of the most important objectives for logistics service providers, and it is not clear how minimizing emissions impacts total costs. In urban areas, speeds can vary significantly due to congestion over the course of the day, and the total cost and fuel consumption associated with different paths between customers can vary based on travel speed and the load on the vehicle. To compute cost-effective and environmental-friendly routes in urban areas appropriately, large amounts of detailed speed data are needed in adapted vehicle routing algorithms. This paper compares the total cost (based on combined driver and fuel costs), fuel consumption (emissions), distance, and travel time for routes resulting from optimizing each of those measures. We explore the impact of multiple considerations on these measures as well as the structure of the routes themselves. We consider driver hourly cost, fuel cost, customer geography (inner city, suburban, mixed), customer load distribution (homogeneous versus heterogeneous), vehicle size (standard versus heavy), fleet composition (homogeneous versus heterogeneous), traffic congestion (rush hour versus non-rush hour), and whether or not the vehicle is delivering or picking up loads at customers. This extensive set of experiments is conducted based on the LANTIME algorithm, which is a tabu search heuristic that we have adapted to consider complex cost functions and load information. We use a large speed database with millions of speed observations from the area of Stuttgart, Germany, as input for our computational analysis. The results show that the total cost objective produces significantly different routes for mixed fleets, heterogeneous customer demands, and suburban and mixed geography locations. We also observe features about how the structures of the routes differ when total costs are minimized as compared with fuel, such as how heavy vehicles are utilized in mixed fleet compositions and when customers with larger loads are visited. Barrett Thomas is an Associate Professor and a Gary C. Fethke Faculty Research Fellow in the Department of Management Sciences at the Tippie College of Business of the University of Iowa in Iowa City, Iowa. Professor Thomas’ research focuses stochastic sequential decision making with applications primarily in stochastic and dynamic vehicle routing and in workforce planning. His work has appeared in journals such as Operations Research, Transportation Science, INFORMS Journal on Computing, and the European Journal of Operational Research. His research has been sponsored by the United States National Science Foundation as well as private industry. Professor Thomas also serves as an associate editor for Transportation Science, IIE Transactions, and Surveys in Operations Research and Management Science. Professor Thomas currently serves as the Past President of the INFORMS Transportation Science and Logistics Society having served as the Society’s President in 2015. In 2011 and 2012, Professor Thomas served as an INFORMS Board member in the role of Vice President Sections/Societies. In this capacity, he chaired the INFORMS Sections/Societies Committee and Subdivisions Council. INFORMS is the world’s largest professional society devoted to analytics and operations research professionals. Professor Thomas is also a Trustee of Grinnell College and has served as the Vice Chair of the Board in 2014 and 2015 and is now the Chair of the Board’s Trustee & Trustee Organization Committee. From October 17 to October 20, 2016 the third retreat of SocialCars took place at the "Wald- und Sporthotel Festenburg" in Clausthal-Zellerfeld. Bernhard Friedrich, Jörg P. Müller and Markus Fidler will organize the Special Session SS08 "Cooperative (de-)centralized traffic management" at the IEEE 19th International Conference on Intelligent Transportation Systems (ITSC 2016) taking place in Rio de Janeira, Brazil. Join Prof. Dr. Stephan Herminghaus from Max Planck Institute for Dynamics and Self-Organization for a presentation on the research project „EcoBus“ and a following discussion. The lecture takes place on Thursday, September 15, 2016 at 4 p.m. in L3S Multimedia-Hörsaal (15th floor) in Leibniz Universität Hannover, Appelstr. 9a. Das EcoBus-Konzept kombiniert die Vorteile von Taxi- und Busfahrten. EcoBus bündelt Fahrtanfragen mehrerer Fahrgäste in gleiche oder ähnliche Richtungen, weist die gebündelten Fahrten Kleinbussen zu und optimiert deren Routen. Passagiere steigen nacheinander an den von ihnen gewünschten Abfahrtspunkten ein (zu Hause, am Arbeitsplatz, am Freizeitort) und fahren ohne Umsteigen zu ihren gewünschten Zielen. Damit bietet EcoBus zukünftig Transport nach Wunsch von Tür zu Tür. Viel flexibler als ein Linienbus, viel günstiger als ein Taxi. EcoBus bietet flexible, bezahlbare und umweltfreundliche Mobilität für jeden als bedarfsgerechten Service. Geboren am 23. Juni 1959 in Wiesbaden. Studium der Physik und der Bildenden Kunst, Promotion in Physik Uni Mainz (1989), Postdoc am IBM-Forschungszentrum in San José (USA), Habilitation im Fach Physik an der Universität Konstanz (1994), Leiter einer Selbständigen Nachwuchsgruppe am MPI für Kolloid- und Grenzflächenforschung (1996-1999), Professor für Physik an der Universität Ulm (1999-2003), Direktor und Wissenschaftliches Mitglied am Max-Planck-Institut für Dynamik und Selbstorganisation (seit 2003) (vormals MPI für Strömungsforschung), Honorarprofessor an der Universität Göttingen (seit 2005). Join Dr. Giuseppe Vizzari from Department of Informatics, Systems and Communication of University of Milan-Bicocca for a presentation on „Towards integrated models of vehicle-pedestrian interaction“ and a following discussion. The lecture takes place on Thursday, June 23, 2016 at 4 p.m. in Volkswagen 2 (NFF-Research Buliding). The micro-simulation of cars and vehicular traffic is a consolidated research area that produced results whose level of maturity led to a significant impact both on the activity of traffic engineers and planners, as well as to the creation of successful companies developing commercial simulation systems or providing consultancy on their employment. In parallel, models for the micro-simulation of pedestrians have also emerged and affirmed as supports to the design of environments subject to crowding situations. Whereas separately micro-simulation approaches have produced a significant impact, preceded by a body or relevant research, efforts characterised by an integrated micro-simulation model considering the simultaneous presence of cars (and other vehicular traffic like trucks or buses) and vulnerable road users (in particular pedestrians, but also bicycles) are not as frequent or advanced as isolated vehicular traffic and pedestrian models. This lecture will discuss a research effort aimed at defining integrated models of pedestrians and vehicles interaction in the area of a zebra crossing, either signalised or not. The talk will discuss the adopted models, capitalising existing successful researches in the area, the model of the interaction among the different entities and the results achieved. The talk will also discuss the issues related to the validation of this kind of result, also briefly presenting the results of an ongoing work on the analysis of video footage for the acquisition of empirical evidences useful for sake of model calibration and validation. Giuseppe Vizzari is associate professor at the Department of Informatics, Systems and Communication and member of the Complex Systems and Artificial Intelligence research center of the University of Milan-Bicocca. He had his degree in Computer Science at the Department of Computer Science of the University of Milan (Italy), and he received his PhD in Computer Science at the Department of Informatics, Systems and Communication of the University of Milan-Bicocca (Italy). In 2010 he has been JSPS Fellow at the RCAST - Research Center for Advanced Sciences and Technologies at The University of Tokyo (Japan). His research activities mainly concern: knowledge based systems (case-based reasoning and semantic web applications); agent based models and technologies (situated agents models and applications, environments for multi-agent systems, agent-based modelling and simulation). He published more than 100 papers on international journals and conferences. He co-chaired several international workshop and symposia, in particular the Agent Based Modelling and Simulation symposia, held in 2006, 2008, 2010 and 2012 in the context of the European Meeting on Cybernetics and Systems Research and the Advances in Computer Simulation track of the 2008, 2009 and 2010 ACM Symposium on Applied Computing. He was also workshop co-chair for the 2009 IEEE/WIC/ACM International Joint Conference on Web Intelligence and Intelligent Agent Technology (WI-IAT'09). In addition to participating several national research projects, he has led the modeling and simulation activities of the Crystals project, in collaboration with the Centre of Research Excellence in Hajj and Omrah of the Umm Al-Qura University (Makkah, Saudi Arabia) and the Research Center for Advanced Science and Technology of the University of Tokyo (Japan). On June 8 the annual Public Authority Relay Marathon took place in Braunschweig. In total 115 relays with 7 runners started this year. At the end of the day our SocialCars-Team took a great 30th place. Congratualtion! We welcome Juliette Daily and Karen Xia as DAAD RISE fellows at SocialCars. The Research Training Group SocialCars funded by the German Research Foundation (DFG) has a vacancy for a Postdoctoral Researcher in Cooperative,(de-)Centralized Traffic Management. Check here for further information. Public Lecture Series: Prof. Dr.-Ing. Martin Fellendorf (TU Graz): "Mikroskopische Verkehrsflusssimulation - vom Verkehrsmanagement zum automatisierten Fahren" May 26, 2016, 4 p.m.
Martin Fellendorf is professor at the Institute of Highway Engineering and Transport Planning at TU Graz. In his research he focuses on transport planning, transport engineering and traffic related environmental impact. In his presentation he will amongst other things discuss different applications of PTV VISSIM (Verkehr in Städten - Simulation). Prof. Dr.-Ing. Thomas Vietor will discuss "Vehicle Concepts for Urban Mobility". Thomas Vietor is leader of the institute for Engineering Design at Technische Universität Braunschweig. Dr. Frank Hofmann will discuss "Vehicle-to-Vehicle Communication - Status and future challenges". Frank Hofmann is group leader of communications systems at Robert Bosch GmbH. Prof. Dr. Hermann Winner will discuss "(Wie) lässt sich die Freigabeproblematik des automatisierten Fahrens lösen?". Hermann Winner is head of the department Automotive Engineering at Technischen Universität Darmstadt. Prof. Dr.-Ing. Markus Friedrich will discuss "Travel time reliability in road networks". Markus Friedrich is head of the Institut für Straßen- und Verkehrswesen at Universität Stuttgart. Prof. Dr. Markos Papageorgiou will discuss "Freeway Traffic Management in the era of Vehicle Automation and Communications Systems (VACS)". Markos Papageorgiou is head of of the Dynamic systems and Simulation Laboratory at Technical University of Crete. Short Course: Prof. Dr. Markos Papageorgiou (Technical University of Crete) "Traffic Control"
From November 25th to 27th the short course on "Traffic Control" is held by Prof. Dr. Markos Papageorgiou (Technical University of Crete). You'll find further information on the topics here. From October 12 to October 13, 2015 the second retreat of SocialCars took place at the "Wald- und Sporthotel Festenburg" in Clausthal-Zellerfeld. Prof. Dr. Kai Nagel will discuss "MATSim: Möglichkeiten und Grenzen einer verkehrsträger-übergreifenden integrierten mikroskopischen Verkehrssimulation". Kai Nagel is head of the department Verkehrssystemplanung und Verkehrstelematik at Technische Universität Berlin. The Runner-up Award of MATES 2015 (German Conference on Multiagent System Technologies) goes Sophie L. Dennisen and Jörg P. Müller: Agent-based voting architecture for traffic applications. We congratulate both! HAZ Article: "Das Ende der Parkplatzsuche"
On July 1 an article was published in Hannoverschen Allgemeinen Zeitung (HAZ, pg. 14) concerning the research of Fabian Bock, who is a doctoral researcher at SocialCars. Further information about the research of Fabian Bock can be found here. On Wednesday the Behörden-Staffelmarathon around the Ölper See in Braunschweig took place. 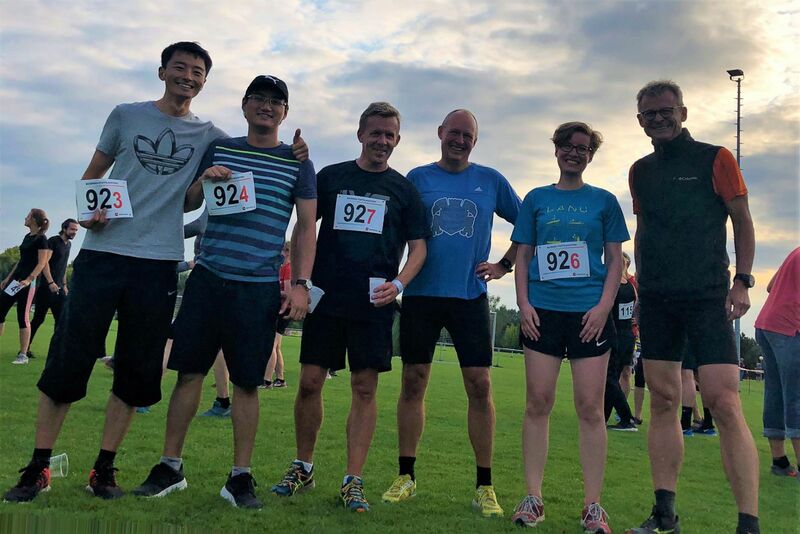 115 teams joined the 6 km long route, among these there was also the SocialCars relay with Gregor Binz, Paul Czioska, Tatiana Deriyenko, Felix Köster, Dirk Mattfeld, Bruno Neumann and Mark Vollrath. 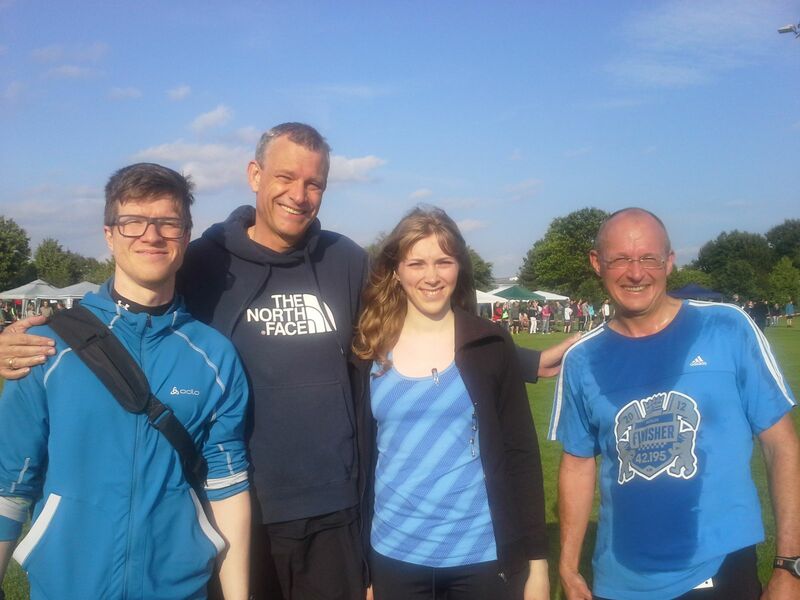 With a all relay team time of 03:20:37 the team was no. 35. Congratulations! We are pleased to welcome Aleksandar Trifunović as doctoral candidate of SocialCars! 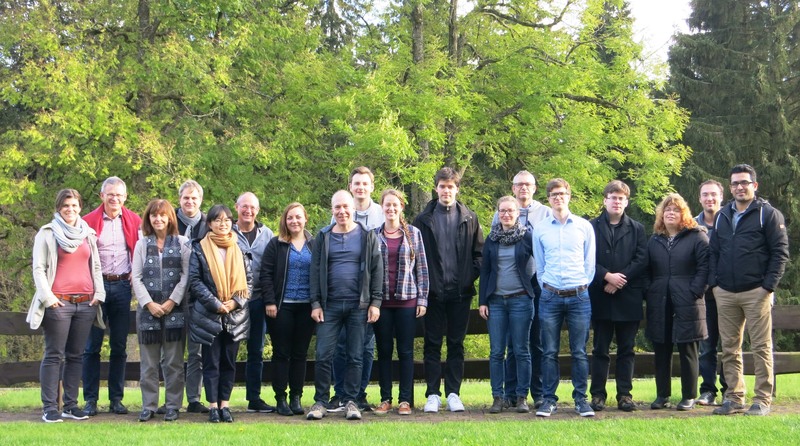 From May 31 to June 3 the joint workshop of all research training groups related to informatics took place at Castle Dagstuhl. The Research Training Group SocialCars participated as well. The first presentation of the open lecture series "Cooperative Traffic Management" was held on Thursday, April 16 at 4 pm. Referee was Dr.-Ing. Ralf Kohlen from VMZ Berlin Betreibergesellschaft mbH, who introduced the audience into the development of traffic management from the persperctive of a traffic information office. Lecture series "Cooperative Traffic Management"
Am 16. April um 16:00 Uhr startet die öffentliche Ringvorlesung des DFG-geförderten Graduiertenkollegs SocialCars zum Thema "Kooperatives Verkehrsmanagement". Als Referent für den Vortrag konnte Dr.-Ing. Ralf Kohlen (VMZ Berlin Betreibergesellschaft mbH) gewonnen werden, der zum Thema "Entwicklung eines Verkehrsmanagements aus der Sicht einer Verkehrsinformationszentrale" vorträgt. Die Ringvorlesung findet im Raum Volkswagen 2 (EG) des vor Kurzem eröffneten NFF-Forschungsneubaus in der Hermann-Blenk-Str. 42 statt. Die Themen und Referenten der Ringvorlesung können Sie dem Flyer entnehmen. Yesterday the opening ceremony of the new building of the Automotive Research Centre Niedersachsen (NFF) took place. More than 150 scientists working in this common mobility research centre, among them members of RTG SocialCars. The Technische Universität Braunschweig has an immediate vacancy for a Doctoral Researcher (salary scale E13 TVL) specializing in sustainable cooperative traffic management for urban environments in the Research Training Group (RTG) “Social Cars – cooperative (de-)centralized traffic management” funded by the German Research Foundation (DFG). The position is offered for a period of three years. The vacancy advertisement offers also a position as Research Associate at the Institute of Transportation and Urban Engineering. From October 15 the RTG welcomes Matthias Rybarsch as PostDoc. On October 15 the PhD students of the RTG moved into their new workplaces. On three days of the week (Wednesday to Friday) they will work together at the Automotive Research Centre Niedersachsen (NFF). From October 13 to October 14 the first Closed Conference of the Research Training Group took place in Goslar (Hotel Hessenkopf). During this two-day event the PhD students present their current research and results, which were then discussed in plenary. We are looking forward to welcome Lukas Bertram as new member of the Research Training Group. Lukas Betram will complete his year as an scientific volunteer (in Germany called "Freiwilliges Wissenschaftliches Jahr (FWJ)"). In addition to other interesting activities of the three member universities the NTH-newsletter also includes an article of the Research Training Group. From September 8th you will find the Institute of Transportation and Urban Engineering in the new building of the NFF at the Hermann-Blenk-Str. 42, 38108 Braunschweig (second floor). It is also the new adress of the RTG and on three days per week working place of the Ph.D. Students.